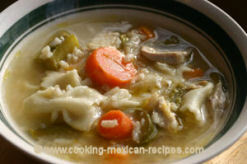 Here is a chicken soup I love to make during the winter. It’s easy, hearty, healthy, and delicious. My husband is not into vegetables but I always manage to sneak in a bunch and he always seems to like it. Rinse the chicken and place in a pot big enough to completely cover with water. Add the cut up onion and celery. Boil chicken for 30 minutes or until done. Remove the chicken carefully (it’s hot) and place in a dish to cool for 15 minutes or until it is cool enough to de bone. Remove the cut up onion and celery and place in a food processor with a little of the soup. Process until smooth and put this back into the water the chicken was boiling in. This is your chicken stock. You may notice some foamy stuff floating around in your chicken stock. Not to worry. Take a slotted spoon and skim it off. While you are waiting for the chicken to cool, start cutting up the veggies you want to add to your soup. Here is what I added to my soup, all were cut up into bite size pieces when required. Feel free to add or subtract any veggies you want. This chicken soup cooks up very quickly as cut up veggies don’t take long to cook. Add the vegetables that take the longest to cook first like the carrots, sweet potatoes and pasta. Then add the rice. Maintain a nice soft boil on the soup on medium heat. Now to get a little more chicken flavor into your soup, I’m going to ask you to add 32 oz of chicken broth. My recommendation for this is Imagine’s Organic Free Range Chicken Broth. You can pick this up at any health food store. It comes packaged in a container like those juice boxes. This one has some nice flavor. When the chicken is cool remove the skin and bones. After cleaning the whole chicken, cut up the larger pieces into bite size chunks. Add the chicken to the soup along with the rest of the veggies. Now it’s time to add a little salt. Try sea salt if you haven’t ever tried it. Chefs use it and now I see why. The flavor is just plain better. Now, to me “regular” salt seems to have a harsh taste to it. Continue to cook your soup just until the pasta is done. Then turn it off other wise everything will get mushy. This will make enough soup to feed a large group. Quantity wise you will have made about a gallon and a half of soup. I like to freeze some of my soup or give some to the neighbors. Beckeritos – a cross between a quessadilla and a burrito.